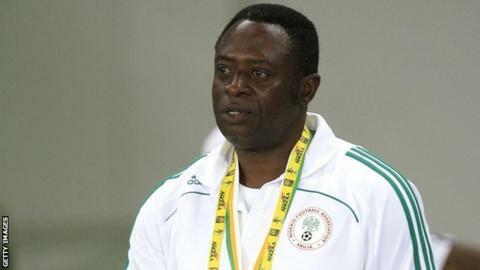 Shaibu Amodu is to replace Stephen Keshi as Nigeria coach, the country's football federation has revealed. The decision comes only hours after Keshi, who had been without a contract, led Nigeria to a 3-1 win to revive their campaign to reach Morocco. After an emergency meeting, the Nigeria Football Federation unanimously opted to appoint Amodu for the next two qualifiers in November. A permanent, foreign coach is expected to be installed after that. Amodu will face two must-win games - away to Congo and at home to South Africa - as the African champions continue to be at risk of failing to qualify to defend their title. Their victory over Sudan was their first in Group A and moves them off the foot of the table but they are three points behind Congo, who occupy the second automatic qualification spot. "The executive committee took a unanimous decision to let Keshi go and Shaibu Amodu to take charge for the next two matches," NFF spokesman Ademola Olajire told BBC Sport. "In recognition of their contributions to the Nigeria game, the executive committee also approved that the trio of Keshi, Daniel Amokachi and Ike Shorounmu should proceed to any coaching course of their choice in any country of their choice to build their capacity, at the expense of the NFF. "All their entitlements will be paid within the next fortnight." During his time in charge Keshi lead the Super Eagles to their first Africa Cup of Nations title since 1994 when they won the trophy in South Africa last year. He became only the second man to lift the trophy as a player and as a coach after Egyptian Mahmoud El Gohary. His success continued in Brazil when Nigeria made into the second round of the World Cup, before losing 2-0 to France. The 56-year-old Amodu, who has previously managed the national team on four different occasions, will be assisted by Gbenga Ogunbote and Salisu Yusuf. Amodu previously led Nigeria to a third-place finish in the 2002 Nations Cup and also held the job between 1994 and 1997. He previously helped the country to qualify for the 2002 World Cup in Japan and South Korea. Under his stewardship, Nigeria qualified for the 2010 World Cup in South Africa but Amodu was sacked despite the team's third-place finish at the 2010 Africa Cup of Nations in Angola. It was the second time he had been removed from his post ahead of a World Cup finals tournament - Amodu was also fired ahead of the 2002 edition after Nigeria finished third at the 2002 Nations Cup in Mali. Meanwhile, Samson Siasia, who was fired as Super Eagles coach in October 2011, has returned as the national under-23 coach.